How's your week going? Mine is flying by. I've been busy making new dog toys, reading books, and preparing for playoff hockey which I'm currently watching while typing this post out during commercials. Just getting the most out of my time! So this morning I was sipping on some delicious juice I got this idea to use the pistachios that I got last week at the grocery store. Pistachios are probably my favorite nut behind cashews (although almonds are up there too) and they're not typically something I eat. So this is a special treat for me. Yay! I was removing the shells off of the pistachios for like an hour this morning but that's okay. I felt accomplished after it was all over, especially when I remember that I was actually saving money because shelled pistachios are cheaper than unshelled pistachios. Saved money on pistachios goes straight towards fruit. I don't know how this conversation turned into what it has. So back to the important stuff. The cookies. Man, oh man. These cookies are so soft and gooey. It almost reminds me of the texture of a smooth caramel. Mmm! 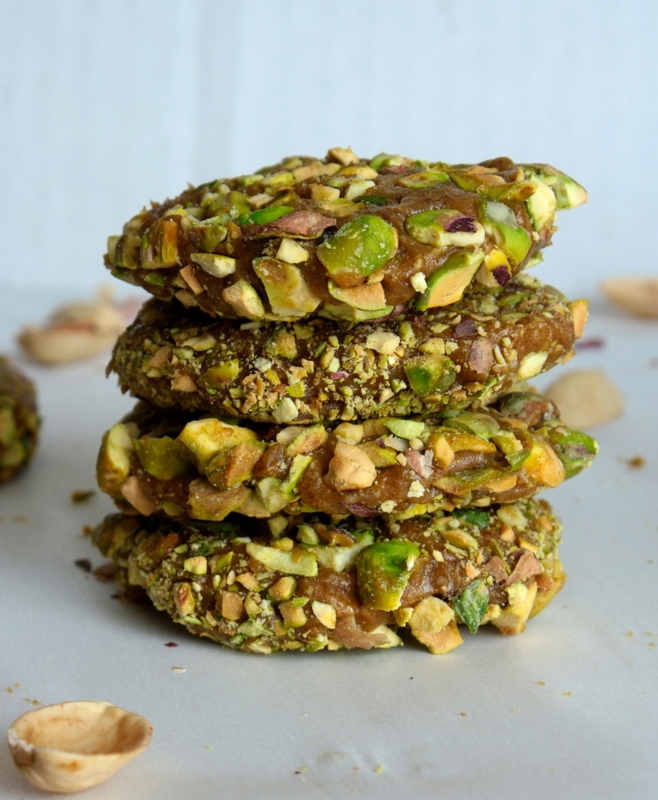 The crushed pistachio coating makes for a perfect cookie crunch. Combine the first four ingredients in your blender or food processor. Using coconut oil or water on your hands, remove mixture from blender and roll into balls. Roll balls in crushed pistachios coating them. Press them down into cookies or leave them as balls if you'd like. Serve, enjoy!